with Craig Christenson, left, and David Thompson. Ashley Rose Salvitti had a touch of the tour guide in her all along. Whenever friends and family came to Portland, she’d cook up itineraries jam-packed with food, fun and plenty of craft beer. It wasn’t hard; after years working as a brewery server, this woman knew her brews. She also knew how to educate and entertain the people doing the drinking, so when those mini-tours earned high praise, Salvitti took a loan from her home-brewing father, purchased a tour bus and christened herself Owner and Beer Lover at Brewvana Portland Brewing Tours. Like many small operations, Brewvana was inspired by passion and enthusiasm more than deep entrepreneurial know-how. A little bravery does a small-business owner good. But there’s no denying the risks entrepreneurship entails: The Small Business Administration estimates just two-thirds of small businesses survive beyond year two. Luckily, Salvitti was making her move in a city with its own secret small-business weapon: the Portland Business Alliance’s Small Business Management Scholarship Program. Back in 2009, out of a desire to better support entrepreneurs like Salvitti, Portland’s Chamber of Commerce — known as the Portland Business Alliance — set out to create a training series that would connect small businesses with the resources, education and mentoring they’d need to survive the starter years and thrive throughout the ensuing business cycle. For help customizing and conducting the program, the Alliance tapped Portland Community College’s Small Business Development Center (SBDC). And to keep the program accessible and essentially tuition-free, the Alliance turned to longtime member company Bank of America, who stepped up and agreed to be the presenting sponsor of the program through its charitable foundation. With a philanthropic focus on jobs, hunger and housing, Bank of America has long funded traditional workforce development nonprofits in Portland — groups like Dress For Success Oregon, Portland Community College, Oregon Tradeswomen and Hispanic Metropolitan Chamber — and sustainably funding this program was a natural next step, says Craig Christenson, Bank of America’s Senior Vice President and Small Business Banking Manager for Oregon and Southwest Washington. 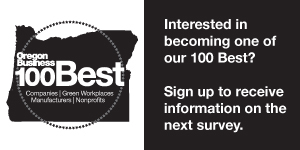 Annually, the Alliance offers spots in the program to 12 Portland businesses who have logged three to five years in operation, have at least one full-time employee and are ready to take their endeavor to the next level. Eight years and seven graduated cohorts in, the program boasts a broad cross-section of alumni, from media and energy to tech and tourism companies. Students of the Portland Business Alliance small business education program. And each cohort accelerates the small business community’s shared learning curve, BofA’s Christenson points out: the lessons multiply, small business thrives, and the surrounding community thrives, too, with more jobs and revenue created, and more local products and services purchased. So what’s next for Brewvana? Salvitti would love to open a taproom for offsite tastings and beer education classes, but the moment’s not quite ripe. By now, she’s learned that good ideas, like good beers, need time to ferment. “I’m reaching for the sky, thinking about the sky — I’m all up there,” she says. “But I have to bring myself down and take one step before the next and really prepare. You have to think about those decisions and consider every expansion with care. We’ve come a long way, and we want to do it right. Already an established business or business leader and wondering how you can help support this program? Consider donating financial support through the Portland Business Alliance Charitable Institute. Demand for the program is high, and more funding could mean a second yearly cohort. 136- Number of jobs created during participation in the 10-month class — plus many more in ensuing years.